Last summer Nicole Richie was pictured numerous times wearing a pair of Modern Vintage plaited flat sandals, these sandals originally retailed at $225 and are now no longer available. 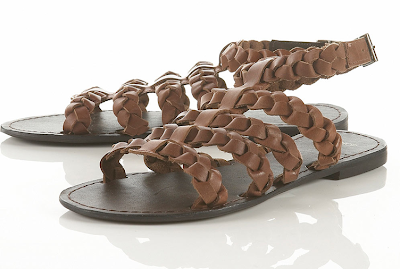 I have found an identical look-a-like pair of sandals from Topshop. Not only are they identical to Nicole Richie's plaited Modern Vintage sandals they are also a steal at just £28.